I recently presented FLASHMOB DANCE at the BC Provincial Intermediate Teachers’ Association (PITA) Fall Conference. What? You haven’t done a flashmob dance with your students? This is the Eurovision Flashmob Dance called Glow done in 2010 all over Europe. If you missed my presentation you may download my Flashmob summary. Contact me if you would like me to assist your school on putting on such an event. 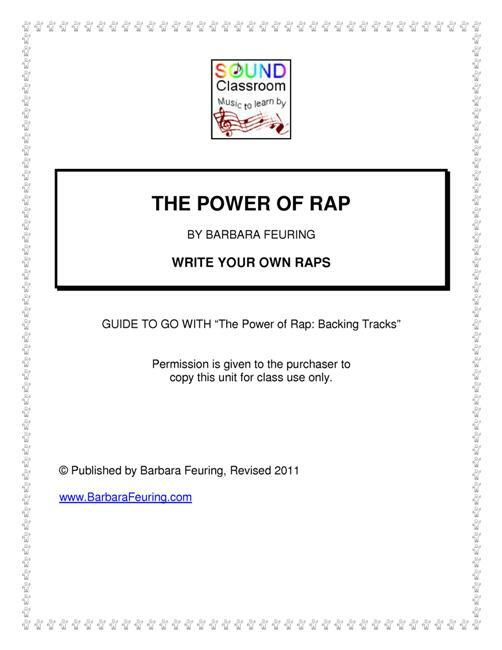 I developed this teaching unit a number of years ago in response to my students' request to "do rap" in music class. I created a guide to help students and teachers write a rap to help remember facts and rules. It is designed to be user-friendly and fun! The lessons should carry you through an eight week period but could also springboard into many other areas such as song and poetry writing and creative movement. The lessons refer to our accompanying 20 RAP TRACKS (in MP3 format) and also outline rules for rapping. Select a topic. This should be general to start with; the title will be selected after the rap is finished. Start writing down everything that comes into your head in sentence fragments and single words. Working with a partner or doing a few together in class will help get you started. Select or circle the thoughts that you want in your rap. Remember to make every word count. Try to use "FAT" words (words that are very descriptive). e.g. scamper instead of run. Write in rhyming couplets when in the beginning stages; later you can encourage them to rhyme within the line. MOST IMPORTANT! Rap is done in 4/4 metre; count 1 - 2 - 3 - 4 when listening to the accompaniment tracks. When you start to write, feel the metre in your head. NOTE: Rap cannot be written in any other metre. Select the background that feels most comfortable; try a few different styles and tempos. Add a chorus or repeated section that will be said or sung by a group or the whole class. This adds variety to the composition. The lessons will guide your and your students through the process of writing a practice rap; writing a commercial rap; and writing an info rap (based on facts you want to remember). Rap music is a great way to involve all of the kids in your class, regardless of music ability. 1 - 2 - 3 - 4, make it sound neat! So come again and say it one more time! 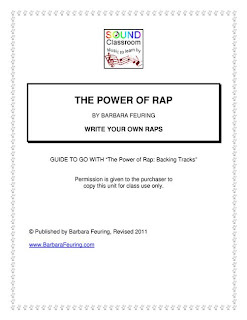 The 30-page guide The Power of Rap (in PDF format) and accompanying Rap Backing Tracks (in MP3 format) can be purchased and downloaded online as one package from TeachersPayTeachers. A free preview is also available.